And replacing water thirsty lawns with alternate plant choices. In this article we explore lawn alternatives in greater depth, discussing several options of equal beauty, yet more environmentally responsible and with greater benefit to you and your community. First, there are several ways to eliminate your lawn and ensure that it doesn’t grow back through your new landscaping. The most ecological method is sheet mulching, though it can be an involved project. Consult your landscape professional regarding all your options. Did you know that many municipalities including the Cities of Goleta and Santa Barbara have water rebate programs, where they will refund up to $1,000 in material costs for replacing lawns and water thirsty landscaping with drought tolerant alternatives? It’s worth investigating before you begin a new project. 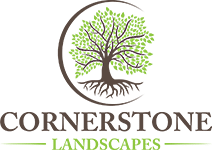 Last year Cornerstone Landscapes successfully helped two clients to receive their rebate from the city after reducing their water consumption with drought tolerant landscaping. If you want a flat, usable space for play and recreation, here’s an idea: Dymondia is a hardy, drought tolerant ground cover that once established, needs about a quarter of the water required by a typical lawn. Check out the description of Dymondia and several other water wise grasses from the City of Santa Barbara. For those of you who don’t need a flat space, or are ready for a whole new look in your front or back yard, there are endless options. With some design innovation and creativity, your space can become a lush landscape with contour and color, or an outdoor room well suited for relaxation in the afternoon. For starters it’s a myth that California Native plants are the best and only choice when it comes to water wise plants. More important is that the plants chosen are native to a climate similar to ours, which is considered one of the seven major global Mediterranean regions. Plants from other bio-regions similar to our California climate include: South American, Northern and South African, Australian, Southern European and Middle Eastern native plants. Many of such plants provide exotic flowers and foliage that appear sub-tropical, when in fact most are sub-desert plants. Each one of these options can be incorporated into a variety of landscape design styles, complementary to your home or business’s architectural style. The desert garden, unlike the previous choices, offers a specific look. Often mixed with boulders and gravel mulch, these landscapes are considered the lowest or even zero water gardens. And finally, we come to my favorite topic: food forests and edible landscaping. With a water crisis looming over most Californians, you may be asking yourself “why water at all?” Well, plants and vegetation of all types sequester carbon, enhance soil health and add beauty to the home and neighborhood. However, if you are going to water, why not produce something that will benefit your health, your household and your community? Kitchen herbs can be easily incorporated into landscaping and provide fresh, delicious enhancements to a meal. Perennial vegetables like kale or collard greens provide ornamental beauty and a great food source. Annual vegetables like tomatoes and corn can be planted, harvested and removed each year. And they can be incorporated into your beds, planted alongside your existing landscaping. Raised beds provide a neat and tidy well-defined area to grow your favorite vegetables. Fruit trees often provide more bounty than one house can use, not to mention shade and spring blossoms. If however you are ready to completely re-design your yard and significantly reduce your trips to the store for produce, consider a food forest. The Lifescape Garden at Santa Barbara City College is a great example of a beautiful ornamental garden that incorporates multiple layers of edible fruits, vegetables and herbs. Food forests can be just as attractive as non-food producing landscapes, and think of the benefits: Water, fertilizer, mulch and maintenance costs produce food in addition to beauty; food that is usually of much higher quality than anything you can buy. Food forests require significant attention to design and implementation, but I believe they are the way of the future as we become more self-reliant and connected to our own slice of paradise right in our own yards. © 2019 Cornerstone Landscapes. Developed by Dharma Communications.